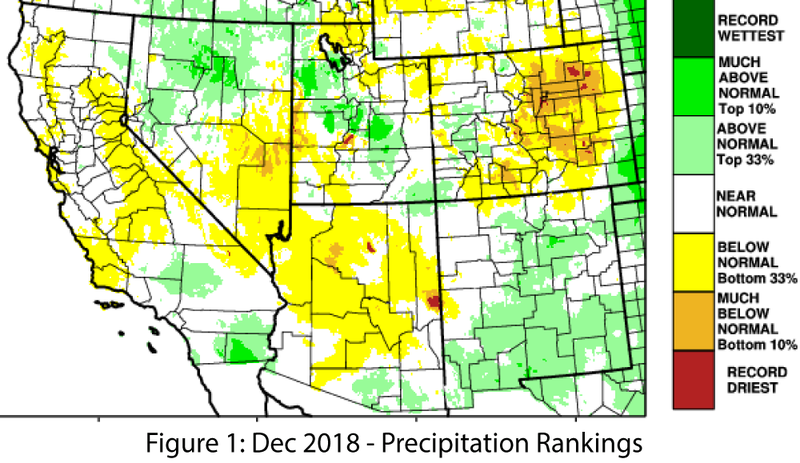 December Precipitation and Temperature: December precipitation was variable across the Southwest, although temperatures were more consistently average to above average. 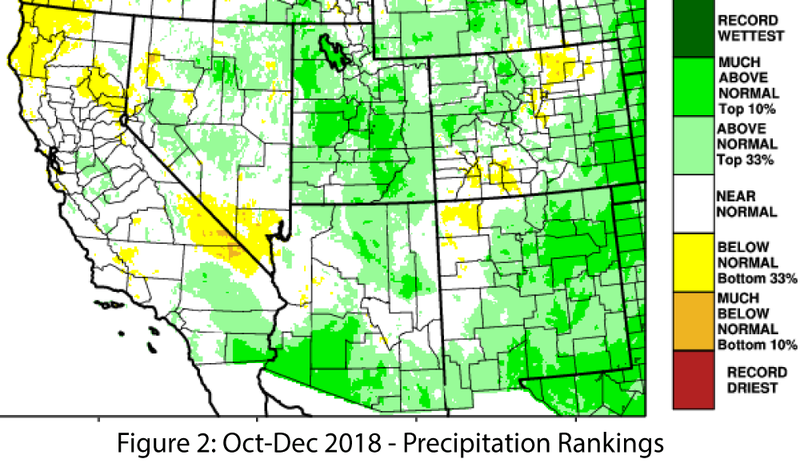 Precipitation in Arizona was mostly below average to average with small areas of above average in the southeastern and northeastern corners of the state (Fig. 1). In New Mexico, precipitation was average to above average across most of the state (Fig. 1). Temperatures ranged from normal to above normal across Arizona and New Mexico. 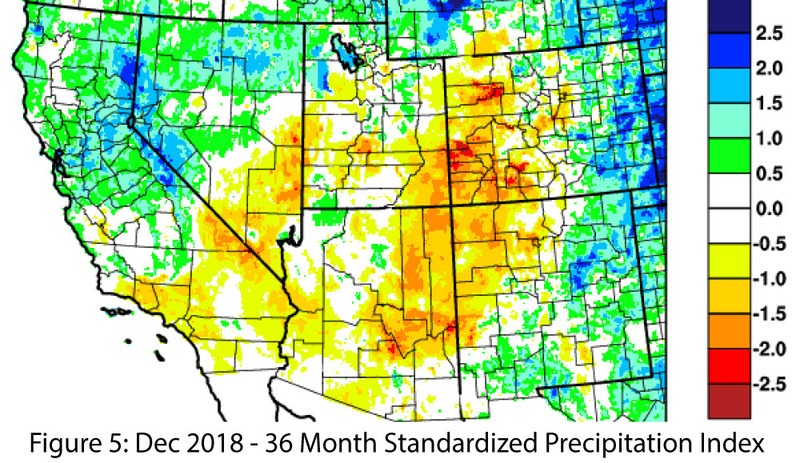 Seasonal Precipitation and Temperature: Three-month precipitation totals reflect the much-wetter-than-average October, in conjunction with some December storm activities, with most of the Southwest receiving above-normal to much-above-normal precipitation since Oct. 1 (Fig. 2). Temperatures over the same period ranged from mostly normal to above normal in Arizona and mostly normal to below normal in New Mexico. 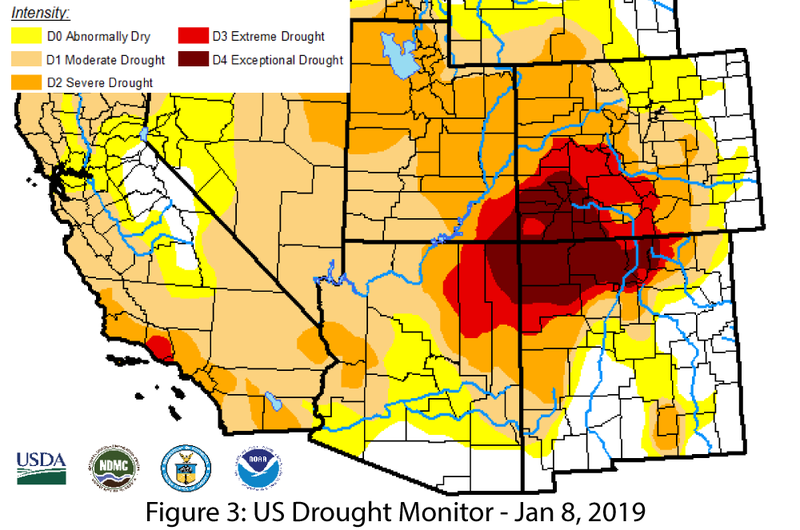 Drought: The Jan. 8 U.S. Drought Monitor (USDM) captures some of the improvements in drought conditions in the Southwest, particularly along the US-Mexico border in Arizona and New Mexico, even while persistent drought conditions remain in the Four Corners region (Fig. 3). Drought in the Southwest poses a challenge in mapping different timescales and intensities of drought on a weekly basis. In a region already characterized by dry conditions, where accumulated precipitation deficits build over seasons and years, these drought characterizations can struggle to capture all of these inputs. Twelve-month precipitation rankings identify areas with accumulated precipitation deficits on an annual timescale (Fig. 4), while the 36-month standardized precipitation index (SPI) for the Southwest (Fig. 5) highlights overlapping areas experiencing drought and precipitation deficits on an even longer timescale. 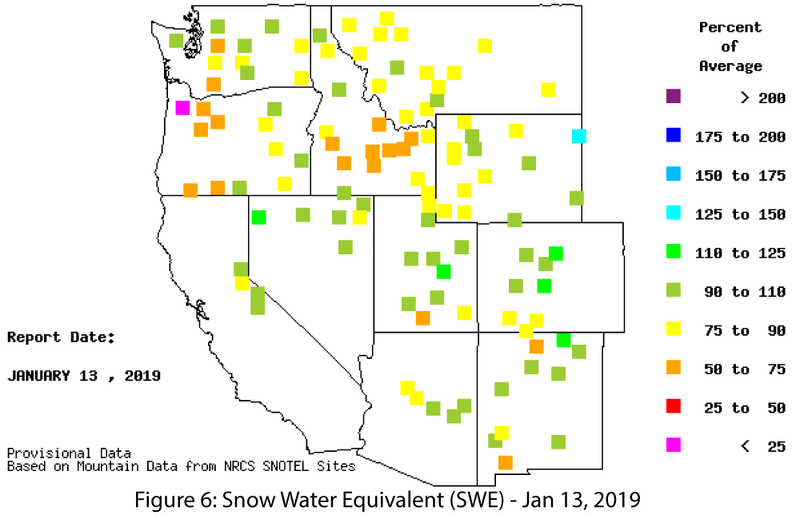 Snowpack & Water Supply: Snow water equivalent (SWE) has seen an uptick with recent storm activity (see an extended discussion of snowpack in the Dec. 2018 CLIMAS Southwest Climate Podcast), although current SWE values in Arizona and New Mexico remain generally near or below average as of Jan. 13 (Fig. 6). Reservoir storage remains a persistent concern, as water levels have been impacted by long-term drought and accumulated precipitation deficit. Most of the reservoirs are at or below their long-term averages, and a few of the Rio Grande reservoirs are especially low (see Arizona and New Mexico reservoir storage). El Niño Tracker: The seemingly imminent El Niño event looks a little less certain at this point (see El Niño Tracker). Sea-surface temperatures (SSTs) remain above average, but are closer to normal compared to last month, and there still has not been the definitive coupling between oceanic and atmospheric conditions that would more clearly delineate El Niño conditions. The forecasting community has been discussing the role that the Madden Julian Oscillation (MJO) might be playing in hindering the development of more definitive El Nino conditions, but forecasters continue to look to spring as the mostly likely period of increased coupling. A weak El Niño event remains the scenario with the highest probability, but it is far from the seemingly sure thing of last month, with forecasted probabilities now ranging from 60 to 80 percent. 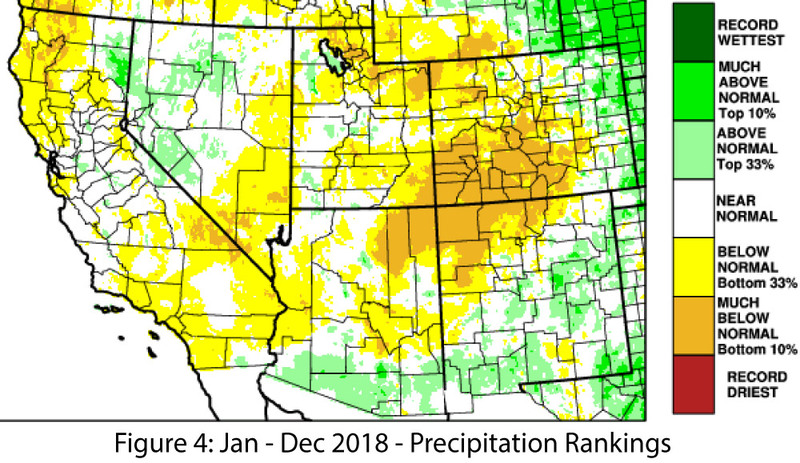 Precipitation and Temperature Forecast: The three-month outlook for January through March calls for increased chances of above-normal precipitation in much of Arizona and northern Mexico and nearly all of New Mexico (Fig. 7, top). 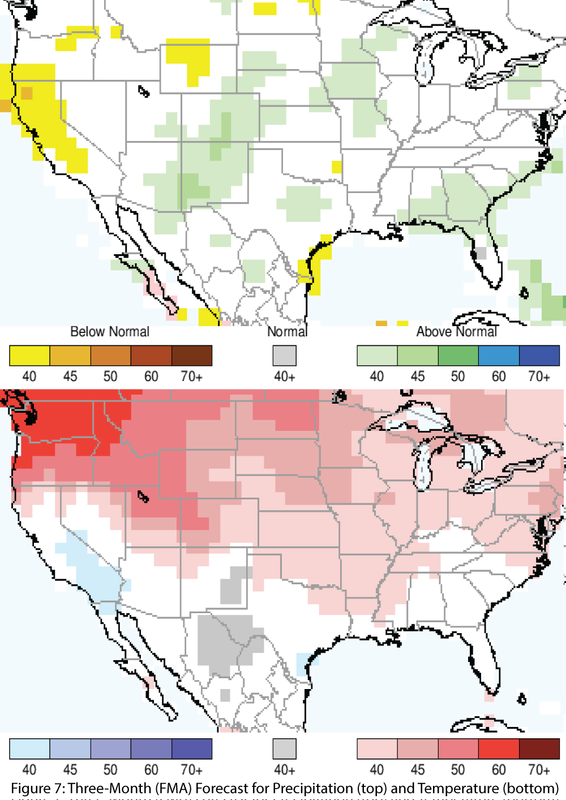 The three-month temperature outlook calls for increased chances of above-normal temperatures in northern Arizona and New Mexico (Fig. 7, bottom). Please Note: Due to the U.S. government shutdown, some federal data and resources are unavailable or are not updating.